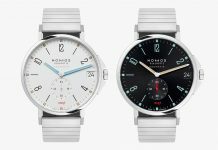 For the second time, Ace Jewellers, the largest watch retailer in the Netherlands and Bauhaus watchmaker Nomos Glashutte have come together to create an exclusive new timepiece in the form of the Nomos Club Campus Amsterdam Limited Edition. 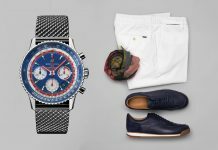 The previous collaboration between the two was inspired by early 20th century art movement De Stijl; this time however, they’re going a little less esoteric and dedicating the new watch to the city of Amsterdam. This time the base watch is the Club Campus, a more sport watch for Nomos Glashutte, but still with the same level of watchmaking finesse. Despite a bulkier, more robust case, it’s as slim as ever and is still immaculately made. The Bauhaus elements however aren’t quite as apparent, especially in this version. The dial is similar to a California in reverse, with the Roman numerals at the bottom as opposed to the top. It’s a seriously cool touch, made all the more so by the black with white-bordered red indexes. The dial’s finished with a white small seconds complete with a red second hand, bringing a lovely balance to the dial and referencing the colours of the flag of Amsterdam. The Club Campus Amsterdam Limited Edition is powered by Nomos Glashutte’s in-house Alpha movement, the first ever developed by the brand. It’s an ultra-slim calibre that’s beautifully decorated with the signature Glashutte stripes and 3/4 plate of German watchmaking and boasts a 43h power reserve. The Club Campus Amsterdam Limited Edition is, as you’d expect, only available from Ace Jeweller boutiques or via their online store, limited to just 75 pieces and priced at £1,247 (including 20% VAT). 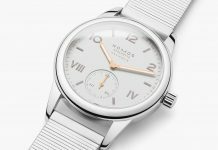 Share the post "Introducing the Nomos Club Campus Amsterdam Limited Edition with Ace Jewelers"